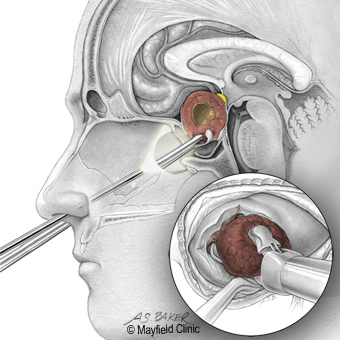 Endoscopic surgery is performed through the nose to remove tumors from the pituitary gland and skull base. In this minimally invasive surgery, the surgeon works through the nostrils with a tiny endoscope camera and light to remove tumors with long instruments. Pituitary tumors can cause hormone problems and vision loss. Tumor removal often reverses vision problems and restores normal hormone balance. What is transsphenoidal pituitary surgery? Transsphenoidal literally means “through the sphenoid sinus.” It is a surgery performed through the nose and sphenoid sinus to remove pituitary tumors (Fig. 1). Transsphenoidal surgery can be performed with an endoscope, microscope, or both. It is often a team effort between neurosurgeons and ear, nose, and throat (ENT) surgeons. Figure 1. 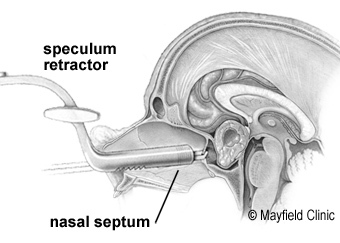 A. Endoscopic transsphenoidal surgery is performed with less disruption to the nose to reach the sphenoid sinus and pituitary. B. 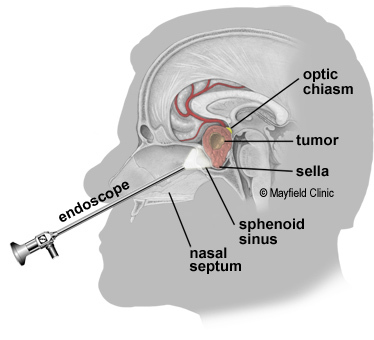 The microscope technique removes a large portion of the septum to insert a retractor so that the surgeon can see to the sphenoid sinus and pituitary. A traditional microscope technique uses a skin incision under the upper lip and removal of a large portion of the nasal septum so that the surgeon can directly see the sphenoid sinus area. A minimally invasive technique, called endoscopic endonasal surgery, uses a small incision at the back of the nasal cavity and causes little disruption of the nasal tissues. The ENT surgeon works through the nostrils with a tiny camera and light called an endoscope. In both techniques, bony openings are made in the nasal septum, sphenoid sinus, and sella to reach the pituitary. Once the pituitary is exposed, the neurosurgeon removes the tumor. Pituitary adenoma: a tumor that grows from the pituitary gland; may be hormone-secreting or not. Craniopharyngioma: a benign tumor that grows from cells near the pituitary stalk; may invade the third ventricle. Rathke’s cleft cyst: a benign cyst, or fluid-filled sac, between the anterior and posterior lobes of the pituitary gland. Meningioma: a tumor that grows from the meninges (dura), the membrane that surrounds the brain and spinal cord. Chordoma: a malignant bone tumor that grows from the skull base. If you have a prolactinoma or a small (<10mm) non-secretory tumor, surgery may not be required. These types of tumors respond well to medication or may be observed with periodic MRIs to watch for tumor growth. 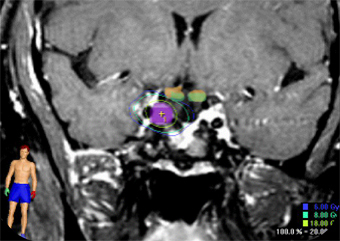 Some tumors extend beyond the limits of the transsphenoidal approach. For these tumors, a more extensive craniotomy combined with skull base approaches may be needed. A neurosurgeon performs transsphenoidal surgery often as a team with an ENT (ear, nose, and throat) surgeon who has specialized training in endoscopic sinus surgery. A team approach allows comprehensive care of both brain- and sinus-related issues before, during, and after surgery. Ask your surgeons about their training and experience. You will have an office visit with a neurosurgeon, ENT surgeon, and endocrinologist before surgery. A consult with an ophthalmologist may be necessary if you have vision problems. During the office visit, the surgeon will explain the procedure, its risks and benefits, and answer any questions. Next, you will sign consent forms and complete paperwork to inform the surgeon about your medical history (i.e., allergies, medicines, bleeding history, anesthesia reactions, previous surgeries). Discuss all medications (prescription, over-the-counter, and herbal supplements) you are taking with your health care provider. Some medications need to be continued or stopped the day of surgery. You may be scheduled for presurgical tests (e.g., blood test, electrocardiogram, chest X-ray, and CT scan) several days before surgery. Stop taking all non-steroidal anti-inflammatory medicines (Naprosyn, Advil, Motrin, Nuprin, Aleve) and blood thinners (coumadin, Plavix, aspirin) 1 week before surgery. Additionally, stop smoking and chewing tobacco 1 week before and 2 weeks after surgery as these activities can cause bleeding problems. No food or drink is permitted past midnight the night before surgery. Arrive at the hospital 2 hours before your scheduled surgery time to complete the necessary paperwork and pre-procedure work-ups. You will meet with a nurse who will ask your name, date of birth, and what procedure you’re having. The nurse will explain the preoperative process and discuss any questions you may have. An anesthesiologist will talk with you to explain the effects of anesthesia and its risks. An intravenous (IV) line will be placed in your arm before transport to the operating room. There are 6 steps of the procedure, which generally takes 2 to 3 hours. You will lie on the operating table and be given general anesthesia. Once you are asleep, your nose is prepped with antibiotic and antiseptic solution. An image-guidance system may be placed on your head (Fig. 2). This device is like a global positioning system (GPS) and helps the surgeon navigate through the nose using a 3D “map” created from your CT or MRI scans. Figure 2. An image-guidance system helps the surgeon navigate through the nose. Skull landmarks and infrared cameras correlate the “real patient” to the 3D computer model generated from the patient’s CT or MRI scans. Instruments are detected by the cameras and displayed on the computer as the surgeon removes the tumor. The ENT surgeon inserts the endoscope in one nostril and advances it to the back of the nasal cavity. An endoscope is a thin, tube-like instrument with a light and a camera. Video from the camera is viewed on a monitor. The surgeon passes long instruments through the nostril while watching the monitor. A small portion of the nasal septum dividing the left and right nostril is removed. 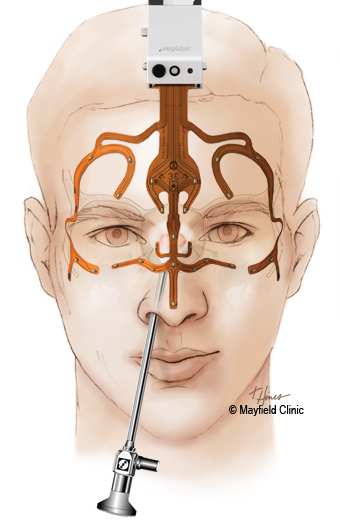 Using bone-biting instruments, the front wall of the sphenoid sinus is opened (Fig. 3). Figure 3. The endoscope is inserted through one nostril. 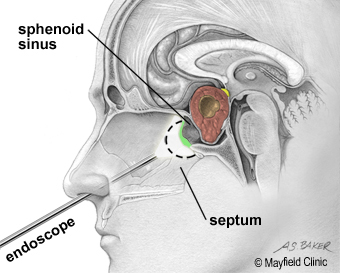 A bony opening is made in the nasal septum (dotted line) and sphenoid sinus (green) to access the sella. At the back wall of the sphenoid sinus is the bone overlying the pituitary gland, called the sella. The thin bone of the sella is removed to expose the tough lining of the skull called the dura. The dura is opened to expose the tumor and pituitary gland. Through a small hole in the sella, the tumor is removed by the neurosurgeon in pieces with long grasping instruments (Fig. 4). Figure 4. The surgeon passes instruments through the other nostril to remove the tumor. The center of the tumor is cored out, allowing the tumor margins to fall inward so the surgeon can reach it. After all visible tumor is removed, the surgeon advances the endoscope into the sella to look and inspect for hidden tumor. 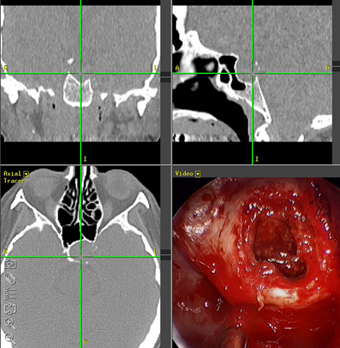 Some tumors grow sideways into the cavernous sinus, a collection of veins. It may be difficult to completely remove this portion of the tumor without causing injury to the nerves and vessels. Any tumor left behind may be treated later with radiation. At some hospitals, surgery can be performed in a special OR room equipped with an intraoperative MRI scanner. The patient can undergo an MRI during surgery. This gives the surgeon real-time images of the patient’s brain to know exactly how much tumor has been removed before ending the procedure. This technology enables more complete tumor removal and may reduce the need for a second operation . After tumor is removed, the surgeon prepares to close the sella opening. If needed, a small (2cm) skin incision is made in the abdomen to obtain a small piece of fat. The fat graft is used to fill the empty space left by the tumor removal. The abdominal incision is closed with sutures. The hole in the sella floor is replaced with bone graft from the septum (Fig. 5). Synthetic graft material is sometimes used when there is no suitable piece of septum or the patient has had previous surgery. 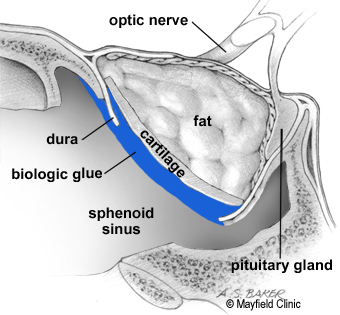 Biologic glue is applied over the graft in the sphenoid sinus. This glue allows healing and prevents leaking of cerebrospinal fluid (CSF) from the brain into the sinus and nasal cavity. Figure 5. A fat graft is placed in the area where the tumor was removed. A cartilage graft is placed to close the hole in the sella. Biologic glue is applied over the area. Soft, flexible splints may be placed in the nose along the septum to control bleeding and prevent swelling. The splints also prevent adhesions from forming that may lead to chronic nasal congestion. After surgery you will be taken to the recovery room, where vital signs are monitored as you awake from anesthesia. Then you'll be transferred to a regular room or the intensive care unit (ICU) for observation and monitoring. You will be encouraged to get out of bed as soon as you are able (sitting in a chair, walking). After surgery you may experience nasal congestion, nausea, and headache. Medication can control these symptoms. An endocrinologist may see you the day after surgery to check that the pituitary gland is producing appropriate levels of hormones. If it is not, hormone-replacement medications may be given. An MRI of the brain will be obtained the day after surgery. In 1 to 2 days, you'll be released from the hospital and given discharge instructions. After surgery, pain is managed with narcotic medication. Because narcotic pain pills are addictive, they are used for a limited period of 2 to 4 weeks. Their regular use may also cause constipation, so drink lots of water and eat high-fiber foods. Stool softeners (e.g., Colace, Docusate) and laxatives (e.g., Dulcolax, Senokot, Milk of Magnesia) can be bought without a prescription. Thereafter, pain is managed with acetaminophen (e.g., Tylenol). Ask your surgeon before taking nonsteroidal anti-inflammatory drugs (NSAIDs) (e.g., aspirin; ibuprofen, Advil, Motrin, Nuprin; naproxen sodium, Aleve). NSAIDs may cause bleeding. A medicine may be prescribed to regulate hormonal levels. Some patients develop side effects (e.g., hunger, thirst, body swelling, mood swings) caused by these medications; in these cases, blood samples are taken to monitor the drug levels and manage these side effects. To prevent injury to the surgical site, avoid blowing your nose, coughing, sneezing, drinking with a straw, or bending over/straining on the toilet for 4 weeks. Do not drive for 2 weeks after surgery unless instructed otherwise. Fatigue is common after surgery. Gradually return to your normal activities. Walking is encouraged; start with a short distance and gradually increase to 1 to 2 miles daily. You may shower the day after surgery unless otherwise instructed. To relieve nasal congestion, prevent bleeding, and promote nasal healing, you will be given two sprays for the nose: a nasal decongestant and a salt water spray. If you had an abdominal incision to obtain a fat graft, it should be left open to the air with no bandage. Avoid direct water on the incision and apply Vitamin E liquid daily. Continual postnasal drip, nasal drainage, or excessive swallowing. These problems may be a signal of cerebrospinal fluid leakage. Uncontrolled nosebleeds or nasal congestion with difficulty breathing. A temperature that exceeds 101 °F, decreased alertness, increased headache, or severe neck pain that prevents lowering the chin toward the chest. Excessive thirst, weight loss, or increased urine output. An appointment for a follow-up visit with your ENT surgeon is typically scheduled 1 week after surgery to remove any nasal splints and to check the surgical site. The ENT will see you as needed until the nasal cavities are healed. Typically, this requires 2 to 4 visits. Small crusts often form in the nose that can cause nasal congestion. The ENT surgeon will spray the nose to provide local anesthesia to the nasal cavities. Crusts can then be removed comfortably. Four weeks after surgery, the patient will be instructed to use a nasal saline rinse. The rinse will decrease the need to remove crusts and hasten nasal healing. An appointment for a follow-up visit with your neurosurgeon will be scheduled for 2 to 4 weeks after surgery. An endocrine follow-up may be recommended to determine if hormone replacement medications are needed. If the tumor is hormone secreting (prolactinoma, Cushing’s, or acromegaly), the endocrinologist will follow your hormone levels after surgery to determine whether you are cured. Patients with Cushing’s disease usually have small tumors (microadenomas) and are surgically cured about 90% of the time . Patients with acromegaly often have larger, more invasive tumors. The success rate is about 60% with growth-hormone secreting macroadenomas . Some pituitary tumors remain surgically incurable due to invasion of the cavernous sinuses and other important structures. Radiosurgery can be used to treat unresectable tumor remnants with very good long-term control rates (Fig. 6). If there is residual tumor after surgery for acromegaly, Cushing’s disease, or prolactinomas, medical treatments are available to control the excess hormone secretion. Figure 6. Radiation may be used after surgery to control remaining tumor that has invaded the cavernous sinuses. Since it is impossible to predict whether or when a tumor may recur, periodic monitoring with MRI scans is needed to watch for changes or regrowth. vision loss: the optic chiasm can be damaged during surgery. If vision problems were present before surgery, decompression may not restore normal visual function. The nerve may have been permanently damaged by the tumor. damage to normal pituitary gland: can occur 5 to 10% of the time for macroadenomas. Hormone replacement may be required after surgery, such as cortisol, thyroid hormone, growth hormone, estrogen, or testosterone. diabetes insipidus (DI): caused by damage to the posterior lobe of the pituitary gland. DI leads to frequent urination and excessive thirst, because the kidneys inadequately concentrate the urine. This effect is usually temporary, lasting 1 to 3 days. DI can be controlled with medication called desmopressin acetate (DDAVP) in nasal spray or pill form. Permanent DI is rare and controlled with medication. cerebrospinal fluid (CSF) leak: the fluid surrounding the brain can escape through a hole in the dura lining the skull. In 1% of transsphenoidal cases, a clear watery discharge from the nose, postnasal drip, or excessive swallowing occurs; may require surgery to patch the leak. meningitis: an infection of the meninges often caused by CSF leak. sinus congestion: small adhesions can stick together and form scars that block air flow through the nose. nasal deformity: caused by bone removal or adhesions; may be corrected by surgery. nasal bleeding: continued bleeding from the nose after surgery occurs in less than 1% of patients. May require surgery to correct. stroke: the carotid arteries and cavernous sinuses located on either side of the pituitary may be damaged during surgery causing an interruption of blood supply to the brain. Intraoperative diagnostics, including the Mayfield MobileSCAN CT and intraoperative MRI, give up-to-date images of an operation and help surgeons confirm that every bit of tumor has been removed.